If you followed the first season while it was airing then it's probably been a while since you watched it by the time this came out. If that's the case then you might enjoy a little refresher. For me, this really got me back into the innocent feel good mood that Kimi Todo puts you in and got me pretty excited about the 2nd season. If you've just recently caught up with the first season however you could opt to skip this one unless you're a perfectionist and need to watch every single release or just a die hard Kurumi fan, 'cause by watching this you basically get to chat with her for 22 minutes. We also get to watch the new OP and ED credits which I very much enjoyed, so if you're an anime music person like me you might want to sneak a peek at this episode at least. Lets enjoy our season 2! It's coming from Kurumi-chan's point of view. This episode if more of a Prologue for the first season. Kurumi is the protagonist in this episode, and it is much revealed here that she doesn't really hate Sawako. Kimi ni todoke kataomoi is basically a recap of the first season and not really needed to watch to go onto the second season. I'd only recommend this if you endured the long wait for the second season and want to refresh your memory from the first season. The recap is told through Kurumi as you can remember, she is the antagonist and tries every way possible to hinder Sawako and Kazehaya from falling for each other because she likes Kazehaya as well. As she recalls all the memories she experienced from last season she walks to a store to buy chocolates for Valentine's day for who else but Kazehaya. As the story comes to a close it sets you up for the concluding season for Kimi ni Todoke. The OP and ED for Kataomoi are very good in fact and relate to the story very well. The OP and ED are also used in the second season, so the story recaps the first season and gets you into the right mood as well. There wasn't nothing special about the art or characters that changed than the first season, so not much to say about them rather than they didn't change. 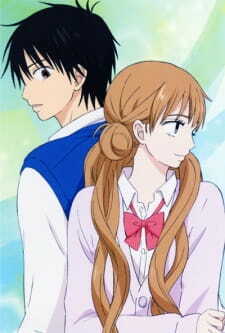 This isn't a must watch, but a very good follow up for the second season for kimi ni todoke.